The Internet is commemorating Michelle Obama's final morning as First Lady by turning her into a #NeverTrump meme. 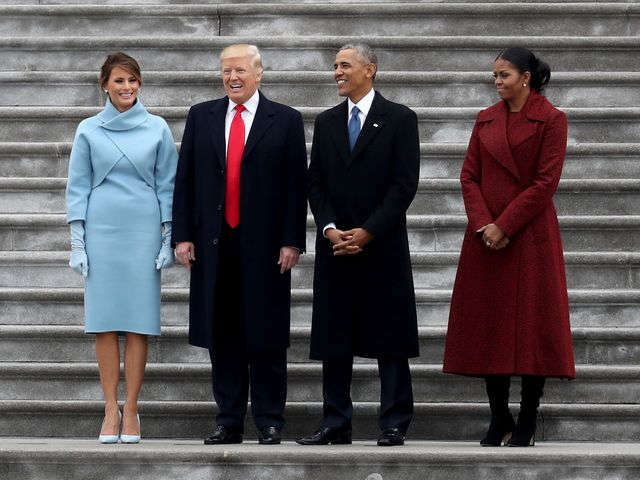 Before Donald Trump's presidential swearing-in Friday morning, he and Melania met the Obamas at the White House for a pre-inauguration coffee ceremony. And as the two first families posed for photos together, Melania handed Michelle Obama a gift box wrapped in Tiffany blue. While the meeting was perfectly diplomatic, screengrabs of Michelle's expression became an instant meme. Is that a side-eye, or just a bad camera angle? You be the judge. Michelle: Hi how are you? Melania: Hi how are you? Michelle: Oh, what is it?